Napoleon set out to reform the French legal system in accordance with the ideas of the French Revolution, because the old feudal and royal laws seemed confusing and contradictory. Before the Napoleonic Code, France did not have a single set of laws; law consisted mainly of local customs, which had sometimes been officially compiled in "customals" ( coutumes), notably the Custom of Paris. There were also exemptions, privileges, and special charters granted by the kings or other feudal lords. During the Revolution, the last vestiges of feudalism were abolished. 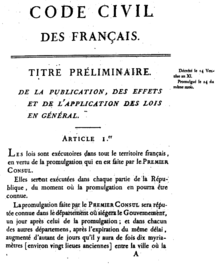 In 1791, Louis Michel le Peletier de Saint-Fargeau presented a new criminal code to the national Constituent Assembly. He explained that it outlawed only "true crimes", and not "phony offenses created by superstition, feudalism, the tax system, and [royal] despotism". He did not list the crimes "created by superstition". The new penal code did not mention blasphemy, heresy, sacrilege, witchcraft or homosexuality, which led to these former offences being swiftly decriminalized. In 1810, a new criminal code was issued under Napoleon. As with the Penal Code of 1791, it did not contain provisions for religious crimes or homosexuality. The commercial code (code de commerce) was adopted in 1807. The kernel of the commercial code is the BOOK III, "Of The Different Modes Of Acquiring Property", of the Napoleonic Code. It is a norm about the contracts and transactions. In 1808, a code of criminal instruction (code d'instruction criminelle) was published. This code laid out criminal procedure. The parlement system, from before the Revolution, had been guilty of much abuse, while the criminal courts established by the Revolution were a complex and ineffective system, subject to many local pressures. The genesis of this code resulted in much debate. The resulting code is the basis of the modern so-called " inquisitorial system" of criminal courts, used in France and many civil law countries, though significantly changed since Bonaparte's day (especially with regard to the expansion of the rights of the defendant). The possibility of lengthy remand periods was one reason why the Napoleonic Code was criticized for its de facto presumption of guilt, particularly in common law countries. Another reason was the combination of magistrate and prosecutor in one position. However, the legal proceedings did not have de jure presumption of guilt; for instance, the juror’s oath explicitly required that the jury not betray the interests of the defendants and not ignore the means of defense. Whether or not the Cour d'assises, whose task was to judge severe crimes, were to operate with a jury was a topic of considerable controversy. Bonaparte supported jury trials (or petit jury), and they were finally adopted. On the other hand, Bonaparte was opposed to the indictment jury (" grand jury" of common law countries), and preferred to give this task to the criminal division of the Court of Appeals. Some special courts were created to judge of criminals who could intimidate the jury. A civil code with strong Napoleonic influences was also adopted in 1864 in Romania, and remained in force until 2011. The Code was also adopted in Egypt as part of the system of mixed courts introduced in Egypt after the fall of Khedive Ismail. The Code was translated into Arabic from the French by Youssef Wahba Pasha between 1881 and 1883. Other codes with some influence in their own right were the Swiss, German, and Austrian codes, but even therein some influence of the French code can be felt, as the Napoleonic Code is considered the first successful codification. ^ a b Arvind TT; Stirton L (March 2010). "Explaining the Reception of the Code Napoleon in Germany: a fuzzy-set qualitative comparative analysis". Legal Studies. 30 (1): 1–29. doi: 10.1111/j.1748-121X.2009.00150.x. Archived from the original on 2013-01-05.